Google and Speed are very much interlinked. 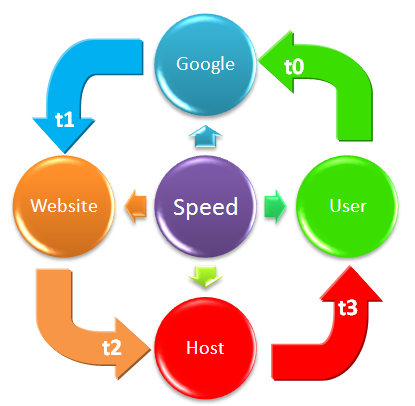 Matt Cutts officially announced that speed would play a role in the Google ranking algorithm. This announcement makes sense when put in perspective with the imminent release of Caffeine, an improved version of Google search with a strong emphasis on speed. The SEO implications are considerable, maybe more on Caffeine that on adding speed in the ranking algorithm. Marc wrote two months ago about Google Caffeine if you need more information on the topic. During the interview for Web Pro News, he released two key points about Caffeine. The first is that one data centre will be delivering Caffeine search results, representing a very small portion of the total search results delivered, and this will happen before the end of the year. The second point is that Google will start rolling out Caffeine across more data centres in January 2010. Speed is already a factor in the AdWords quality score. So what is the speed factor going to change for organic results? Well, probably not much really, not in terms of rankings at least. It is more likely to give a small ranking bonus to faster websites than penalising the slower ones. The speed of your web pages can have a profound impact on conversion rates, on user engagement, and on the overall experience of your web site. When you have only 3-4 seconds to convince a user that you have what it’s looking for, you don’t want to waste half of this time loading the page, and run the risk of a new visitor landing on a page already frustrated by your site’s user experience. What speed is definitely going to change, is the overall online experience for the users. The improvements in Internet connections’ speed in the past 10 years have increased the users’ level of expectations and it now makes sense to improve user experience by preventing frustration through improved page load time. More speed also means less bandwidth and hosting costs, more traffic, better conversion rates and therefore more profit for websites. It also means reduced costs for hosting providers. But the real winner is obviously Google itself. By encouraging webmasters to optimise the load speed on their websites, the world’s number one search engine will benefit from less bandwidth consumption, less server space, better user experience, more AdSense ads impressions, and therefore more profit. This is without taking into account the savings that Caffeine’s increased speed will also benefit Google, by increasing the number of search results and ad delivery frequencies (less load time = more impressions/sec = more click opportunities = more $$$). What does it means for rankings? 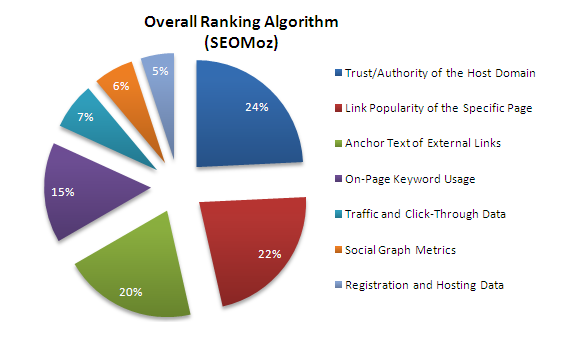 According to the SEOMoz 2009 Search Engine Ranking Factors, “Registration and Hosting Data” is believed to only account for 5% of the overall Google ranking algorithm. it would be logical that speed would enter in this category, so it would be very surprising to see the share of this type of factors increase dramatically in the overall ranking factors. However, a slight increase in search engine visibility is not such a bad thing for an SEO, and if faster websites might get a slight boost in rankings, no specific penalties have been announced for slower sites. The big question is to understand how they are going to benchmark your site’s speed. Some are already arguing that websites with better hosting solutions would be favoured compared to the smaller sites that only have a standard FTP hosting solution. 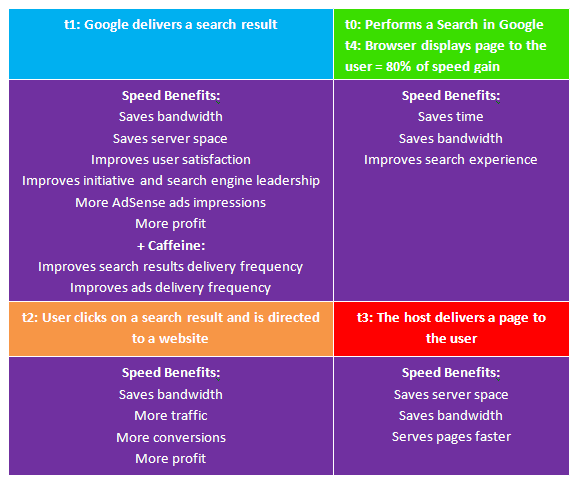 As the following study shows, most of the benefit to be gained comes from the frontend, which any webmaster can control, so I disagree with the ones arguing that companies with more money would have a competitive advantage when it comes to page load time. Which Speed are we talking about? A recent study by O’Reilly on website optimisation shows that a 50% reduction in backend response times (server side response processing, database processing etc), decreases overall times by 5% – 10%. Backend performance improvements also often require complex code changes, expensive hardware or software upgrades, which makes it more difficult to manage. On the other hand, the same study shows that a 50% reduction in frontend performance decreases overall response times by 40% – 45%. This is the part where webmaster can have a significant impact on page load time.